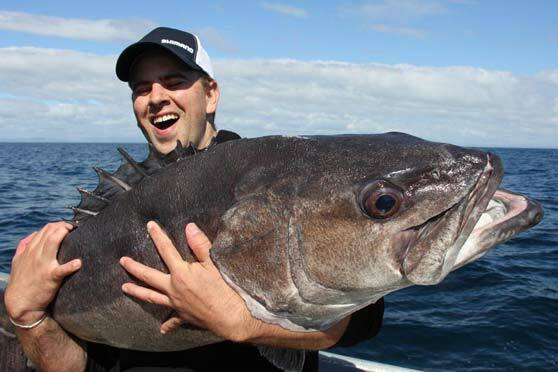 Hapuku or groper and bass are the deepwater kings of sportfishing in New Zealand. These two closely related species grow to large sizes and are available to anglers right around the country, though they’re nowhere as common as they were formerly. 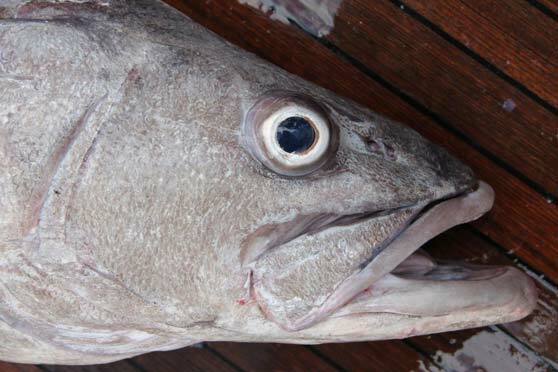 Commercially and recreationally, hapuku (Polyprion oxygeneios) and bass (Polyprion americanus) are often caught with bluenose (Hyperoglyphe Antarctica), a type of warehou unrelated to the other big boys, but often sold as ‘groper’ and equally good to eat. 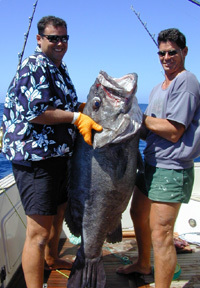 It, too, grows to a large size and is caught using the same gear and techniques as hapuku/bass. Hapuku and bass belong to a family of fishes with the common name of wreckfish. Hapuku are commonly called bass in southern parts of the country and the Maori name for bass is moeone, which is still used in places. All three species occur over deep reefs with bass and bluenose generally found in deeper water than hapuku. However, all three species can be caught at some locations. Hapuku favour reefs in 80-200m of water, but are caught in much shallower water at times, as well as deeper. In the past they were relatively common inshore, but are now rare. In a few isolated spots it’s still possible to catch them from the shore. 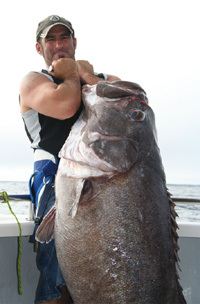 Bass and bluenose are usually found in water over 200m deep and as far down as 500m. Bass become increasingly common in northern waters. Larger hapuku and bass are almost always associated with reef structure; smaller fisher may be caught out in the open over mud or sand. Fish found in the open tend to be smaller specimens (‘pups’ or ‘schoolies’ and are usually hapuku. Bass seldom feed in the open, but both hapuku and bass have pelagic juvenile phases with small fish associating with floating objects. Bluenose also prefer rough ground, but also school in deep water over open ground where they are targeted by trawlers. Bluenose eat a lot of invertebrates, but like hapuku and bass also eat fishes, so they’re easily caught using conventional baits. All three ‘gropers’ grow to large sizes and all are good eating fresh or frozen. 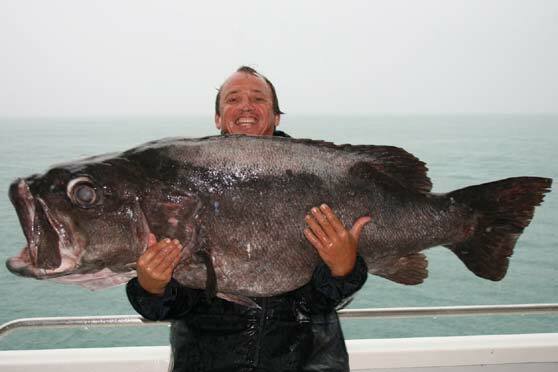 Hapuku can reach 1.8m in length and weigh 80kg or more; bass get even bigger: 2m and 100kg-plus. Average sizes are similar for both at around a metre with the stouter bass weighing heavier for its length. School fish are generally less than 15kg in weight and ‘pups’ under 10kg. Bluenose are on average smaller – 60-100cm – with a maximum of 1.3m and 50kg. 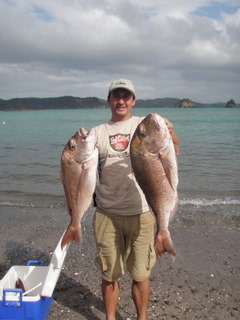 Hapuku and bass look very alike, but are easy to tell apart when placed side by side. Hapuku are greyer in colour – blue when young – shading abruptly to almost white on the belly. They are generally slighter and more elongated than bass and have a noticeably longer lower jaw, giving them an underslung look. Bass are more heavily built and have a shorter, more rounded head with a lower jaw which projects only slightly. They tend to be darker brown in colour grading gradually in grey-brown on the belly. Juvenile fish have pale bands or mottling. Bluenose look quite different and are much more laterally compressed. Their plump bodies are solid and deep with large, blunt heads, large eyes and relatively small mouths compared to hapuku and bass, although large for fish in the warehou family. They’re blue-grey above, shading to grey and silver on the sides and belly. Once caught, the skin exudes a lot of slime. Food for all three species includes a wide range of crustaceans, invertebrates and fishes, some large. Big groper have large appetites and their capacious mouths can accommodate large prey items, which they engulf by opening their jaws and sucking in the prey. Little is known about the spawning habits of any of these species, but it is assumed hapuku and bass free-spawn in coastal waters, with bluenose doing the same in deep coastal waters. Seasonal migrations between shallow and deep water is a feature of the lifecycles of all three, thought to be related to spawning activity. Juvenile groper and bass are sometimes caught over shallow reefs and young fish may well inhabit inshore areas for some years. All three species are slow-growing and long lived, making them vulnerable to overfishing. Hapuku and bass are part of a five-fish limit with kingfish in most places, of which no more than three may be kingfish. 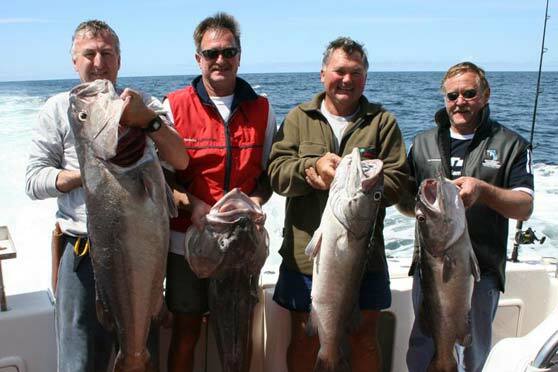 Bluenose are part of a 20-fish finfish limit, except in the southern fishery zone where the bluenose limit is 30. The ideal setup is a reel that holds at least 500m of 37kg braid and a good powerful rod to match it. A shorter rod has better leverage and is easier on the angler but when using superbraid line, a softer tip is preferable. Lighter line such as 24kg can be used but 37kg is recommended. With braid, bites can be felt even several hundred metres below the boat and importantly, the line drag generated by current is minimised. That means you can use less weight than with nylon to get to and stay on the bottom where your baits need to be. Some people believe hapuku/bass are just dead weights on the line; fish with superbraid and you’ll soon learn they are not. Good drags are essential, as are good knots, a gimbal belt and a stand-up harness; 300m is a long way to lift a very powerful 40 or 50kg fish. Various hapuku species are most often caught on set-lines (‘groper/hapuku droppers’) or by rod and line fishing using large fish flesh or squid baits. Livebaits, jigs and large soft plastics also work well, but the tackle and techniques are rather specialised. Most rod and line anglers fish two or three-hook dropper/ledger rigs with short branching traces tipped with large hooks. Hooks may be of the conventional J-type, or more usually are circle-types with recurving points. Here's a pretty basic video on how to tie twisted dropper rigs so your loops stand out from the mainline to minimise twisting. Hapuku rigs are tied or crimped in heavy monofilament line – 150-200kg is usual – and the hooks can be as large as 14/0, though smaller hooks are better if average fish size is smaller and small hooks will catch big fish. Use re-curve or circle hooks for best results and importantly, let the fish hook itself rather than striking when you feel a bite. When you're threading a recurve hook onto your dropper loop, make sure you thread it from the front of the hook so it almost forms a loop on the trace. This is important as it gives a much better hook-up rate with recurve hooks. A slow couple of turns of the handle or a very gradual lift will let the recurve roll into the corner of the jaw as the bait is eaten. Because most hapuku fishing is in deep water from a drifting boat, large sinkers are mandatory. Streamlined ‘torpedo’ or ‘bomb styles are best with weights up to kilo required in some places but generally around 20oz should be adequate. It's best to have a range of weights and a few spares in case of bust-offs as the territory you're fishing is unforgiving and it's not hard to get snagged on the bottom. Generally, attaching the sinker via a short length of light nylon designed to break if the sinker fouls on the bottom can save a lot of frustration and re-rigging and 15 to 24kg nylon is suitable for this purpose. Commercially-tied rigs, some equipped with luminescent tubing, beads and/or rubber squids, are readily available from most tackle retailers and t's easy enough to add your own luminous beads or tubing if you're making your own rigs. These additions are designed to make the bait more attractive down in the dark depths and some anglers go a step further by attaching a light stick or battery powered light to their trace. Check that the swivels, hooks and knots/crimps are of sufficient quality to handle large, heavy fish before purchasing a pre-tied rig. Unlike hapuku and bass, whose swim bladders inflate as they are drawn towards the surface, incapacitating them, bluenose fight all the way and are tougher in proportion o their size. Large soft baits and jigs can be deployed on specialised deepwater jigging gear, or on conventional hapuku tackle, since high-speed retrieves are unnecessary. Jigs and softbaits can be ‘yo-yo-ed’ near the bottom to good effect. ‘Drop-shot’ soft plastic rigs with a large soft bait attached at right angles to the line above the sinker work well.. Almost any fish bait will take hapuku and bass. Live baits – mackerel, blue cod, squid, tarakihi, or any other prey-size species – work very well, often taking larger fish. Cut baits of tuna, kahawai, barracouta, cod or sea perch are good. Alternatively, use whole mackerel or other small fish as bait, or squid, provided they’re large enough and fresh (avoid pink-coloured squid –fish do, too). Make your baits as streamlined as Possible and hook them once through in one end to minimise spinning on the way down. Look for durability in a bait – there’s a lot of winding to check baits. Make sure the baits are large enough to discourage pickers, but not so large as to impede the rig’s rapid descent. You need to be able to reach the bottom to catch these generally bottom hugging fishing. Hapuku hotspots are generally well known by local fishers. Any moderately deep to deep reef, preferably with plenty of current, is a good bet, but bear in mind that fish may be present only seasonally. Some inshore reefs also hold fish at certain times and some of these are in surprisingly shallow water. Most anglers will drift over areas of foul given anchoring is not usually an option due to the depths. Drifiting also covers more ground and lends sone action and life to deadbaits or strips which hapuku tend to find more appealing. Bottom bouncing is the usual technique where once the sinker reaches the bottom, a little more line is let out at regular intervals to keep close to the bottom for as long as possible during the drift. Once the line angle gets too significant (>~30 degrees) then it's probably time to begin the long haul to the surface. If the captain can move the boat to keep the line angle to a minimum then that helps too. 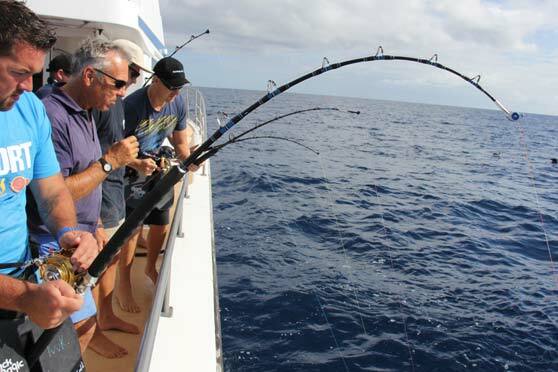 Once a hapuku is hooked, try and get some distance between the fish and the bottom as soon as possible. They are powerful swimmers and once hooked have a tendancy to make every effort to head for home - i.e: rocky caves and holes which will end in tears. The rest of the fight will be pump and wind but note that as they near the surface, the air bladder will expand to such a degree that they will float and you'll need to wind a bit faster to keep the tension on. Acknowledged hotspots include reefs and banks around the Three Kings Islands, White Island and the Ranfurly Banks, but there are thousands of rocks and reefs right around New Zealand that offer good hapuku and bass fishing. Off the west coast the edges of the continental shelf provide near limitless fishing opportunities. Some prospecting with a powerful sounder can bear dividends for the patient angler. Hapuku are most often targeted at or around slack water. They favour ares of high current and in many locations, it’s only possible to fish for them over the turn of the tide. Elsewhere, fishing is possible on any tide, but too much current can make staying in contact with the bottom all but impossible. If the drift is too fast, due to tide, wind or both, the fishing is poor because baits are not spending enough time in the strike zone. In shallower waters, anchoring may be possible, but boat positioning can be critical to success. Berleying is seldom practiced, but deep berleying can pay dividends in shallow water (100m or less).